Bob Kingsley’s Country Top 40 Saturdays from 1 to 5 p.m. Tune in and hear the best today’s country stars have to offer! 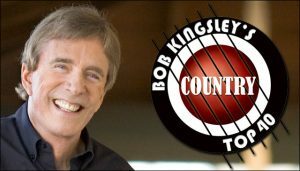 989 Nothing But Hits is bringing you Bob Kingsley Country Top 40 every Saturday afternoon. It’s four hours of facts, fun, and a truckload of great music! Bob Kingsley Country Top 40, heard weekly Saturday afternoons from 1 to 5 p.m. on 989 Nothing But Hits!